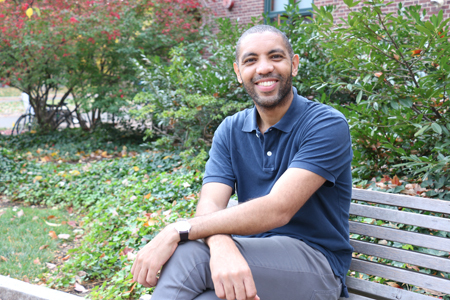 If he ever had any doubt, Emmerich Davies Escobar knew from the day of his on-campus interview that the Ed School was where he wanted to continue his career. “It was clear during my campus interview what a warm community this is. Even though I was interviewing for a competitive job, faculty, staff, and students were incredibly welcoming and made me feel at ease during the whole day,” he says. Joining the Ed School as an assistant professor, fresh from completing his Ph.D. in political science at the University of Pennsylvania, Davies Escobar will be teaching two courses this academic year: The Politics of Education in the Developing World and Comparative Education and International Development. He is excited to add his unique expertise — which includes education policy and politics, the political economy of development, and the politics of service provision, with a regional focus on South Asia — to the work being done at HGSE. How did your work in political science lead you to the field of education? There were two series of events that led me to education. First, living in Philadelphia over the past few years have been eye opening for someone interested in the local politics of education and community participation. I lived across the street from an elementary school that had resisted a charter school takeover and down the road from a middle school that had to close from lack of enrollment and was in the midst of being turned into luxury condos. Although I didn't have any children, you couldn't help but be caught up in the mobilization and debates on a local and citywide level about the perils and benefits of school closures and charter take overs. Second, my academic work in India began with an interest in local community participation and service provision. Increasingly what I saw, however, was the proliferation of private services replacing public services. Government doctors leaving work early to work at private clinics; government teachers recommending parents send their children to private tutors where the tutor happened to be the same teacher. I couldn't help but wonder what effect this was having to the social contract between citizens and the state, when the front-line functionaries of the Indian state, in the form of teachers, were so readily abdicating their posts. Your dissertation — which was awarded the National Academy of Education/Spencer Dissertation Fellowship — was on the growth and impact of private elementary education in India. Will you continue that line of research? My work so far has focused on two questions: Why has there been such a rapid growth in private education in India over the last 30 years? Private schools provide between 30 to 40 percent of all primary-level education depending on what source you believe. And, what are the effects of this growth for relationships between citizens and the Indian state? My work moving forward will certainly continue my focus on India and Indian education. I've made a large investment in India in terms of professional connections, friendships made, and intellectual energy spent. Plus, I find the country fascinating. I have two projects that I will begin this year. Coming out of my dissertation work, I realized the tremendous variation in the quality of government schools in terms of infrastructure and academic quality. What explains this variation? Also, the second question in my dissertation project led me to ask larger questions about political socialization through education. How do people come to hold their political beliefs? India has often changed its history and social science textbooks and my project will ask how this has affected individuals’ sense of history and national politics. What about Harvard/Cambridge/Boston are you most looking forward to? I've been a Red Sox fan since I was five, so I'm looking forward to the Sox World Series victory in Papi's final season!